Hi everyone! Thanks so much the your sweet cat and dog creations you shared with us last week! I got lots of positive comments on the challenge and it was really difficult to choose just one! I enlisted Cassidy's help in picking out my winner; it was just too difficult to do it alone! We narrowed it down to a couple of choices, but in the end, Laurie's card with those sweet little white pups was declared her favorite! 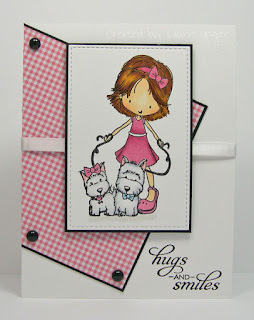 I liked it too, especially with that wonderful pink gingham in the background and the fun sketch! Congrats, Laurie, on being my Headliner this week! Congratulations to all our winners, please pick up your badges here. We hope you come back tomorrow for a happy color challenge from Laurie! Thanks for the shout out! This was a fun challenge! Oh my gosh!!! Thank you Jaydee for picking my "Stressed Out" cat card, I'm just LOL with Joy!! This image truly will lift anybody's spirit, whether they are sick or just plain stressed. Thank you again LeAnne for such a fun challenge and congratulations to the Laurie and all the other winners!!! Thanks so much Hannelie!! This was a fun challenge, so many cute cards in the gallery. A big congrats Laura, cute pups!! Thanks for the shout out, Joanne! Congrats to Laurie and all the winners. Fabulous cards! WooHoo! Thanks for picking my second card as he Headliner! I'm honored! Congratulations to all the winners. Each and everyone of the cards were lovely. Thank you so much for the shout out, truly an honor!! Congrats to everyone!! !